If you want longer hair but have trouble growing it out or just don’t have the patience to wait, hair extensions can be a great solution. Extensions are also a great way to add more volume, create texture or even try out a new colour. In fact, with such a wide array of extensions and hair pieces available, the amount of possible looks is endless! 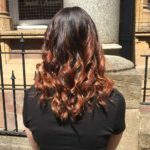 Balmain Hair, the preferred brand of our salon, offers an extensive selection of products including pre-bonded extensions, ring extensions, clip extensions and tape extensions, in a wide variety of colours including hombres and fantasy colours. You can also choose from 100% human hair or Memory Hair, a quick and easy extension that can be applied in under five minutes. How They Work – A small extension (the size of a regular highlight) is added to a small section of your natural hair at the root. They are fused together using a ring or a bond that will last up to three months. Some extensions may last even longer depending on the rate of natural hair growth and how well the extensions are maintained. 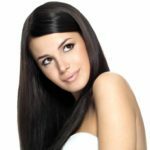 How Long They Last – Since natural hair growth can cause extensions to become visible or even begin to come out after three to four months, it is best to schedule a follow-up visit with your stylist at about four to six weeks. This way, your stylist can repair or re-apply any extensions that are starting to come loose. After the three to four month period, the extensions should be removed completely to prevent damage to your natural hair as it grows out. How They Are Removed – Having your extensions removed by a trained stylist will cause no damage to your natural hair. It is a simple procedure where either a removal solution is applied, which makes the bond disintegrate, or the ring is removed using ring squeezers. The procedure is then followed up with a normal shampoo, condition and blow-dry. You can also have some of the extensions re-applied at a significantly lower cost than your initial application, if desired. How You Care for Them – Always brush your hair with a large, soft bristle brush, starting at the bottom of the hair, moving up to the middle and ending at the roots. Tying your hair back loosely at night will also help to prevent further tangling. When shampooing your hair, always work from the crown downward and brush your hair thoroughly first. Soak your hair with warm water and then apply Balmain cleansing shampoo. Massage in small circles at the root area to wash both the natural hair and the extensions. Then rinse thoroughly, making sure all the shampoo is washed off the roots and repeat, if desired. Follow up with Balmain conditioner on the middle and ends of your hair only. Leave the conditioner on for three to ten minutes and then rinse with warm water. You can also use the Balmain hair mask as a weekly conditioning treatment. Be sure not to rub the roots of your hair when towel drying and always brush from the ends upward. Hair extensions can be air-dried or blow-dried, however if blow-dried, a low heat setting should be used. You can also use hair straighteners, curling irons or rollers, as long as they are kept under 160 degrees. Never sleep with wet or damp hair as it may cause mattes or tangles to the hair and extensions. Be sure to rinse hair thoroughly after washing. Wear a protective cap if you go swimming. Use styling products sparingly and only on the ends of the hair. If your scalp is oily, wash your hair regularly to prevent build-up at the scalp which could make your extensions fall out. If you’re not quite ready to make a commitment for several months or you just want to glamify your look for a special occasion, check out Balmain’s “Memory Hair” Ready to Wear Extensions. They can help you achieve a gorgeous up-do, a luxurious ponytail or just voluminous curls, all in just a few minutes! How You Care For Them – After you are finished wearing the Memory Hair piece, be sure to brush it thoroughly. You can shampoo them as often as desired, by first soaking them in warm water and then gently cleansing with Balmain Cleansing Shampoo. Regular conditioner is not necessary, although you should spritz the piece after it dries with Balmain Memory Hair Conditioning Spray. Memory Hair is soft, lightweight, has a natural shine, blends easily and moves with your natural hair. They can also be curled or straightened with any tool, as long as it does not exceed 160 degrees. For tips on what instruments to use and how to achieve the look you desire, ask your stylist! Book in a free consultation with us now and we will give you our very best advice on how hair extensions can help you.